If I had a dime for every time I heard the claim that Christian theology contradicts itself because it claims that salvation is earned through works and conversely by faith alone… well, I wouldn’t be rich, but I’d have a lot of dimes. Needless to say, I’ve become very familiarized with this objection and have found the answer not only logistically satisfying, but spiritually satisfying as well. So it seems very straight forward. Salvation is determined by faith and not by works. But here is where skeptics normally start throwing out other verses that seem to contradict this theology. “What good is it, my brothers and sisters, if someone claims to have faith but has no deeds? Can such faith save them? Suppose a brother or a sister is without clothes and daily food. If one of you says to them, ‘Go in peace; keep warm and well fed,” but does nothing about their physical needs, what good is it? In the same way, faith by itself, if it is not accompanied by action, is dead. But someone will say, ‘You have faith; I have deeds.’ Show me your faith without deeds, and I will show you my faith by my deeds. You believe that there is one God. Good! Even the demons believe that—and shudder. Here is the key point: James does not say faith is not valid for salvation. He is detailing what constitutes genuine faith. 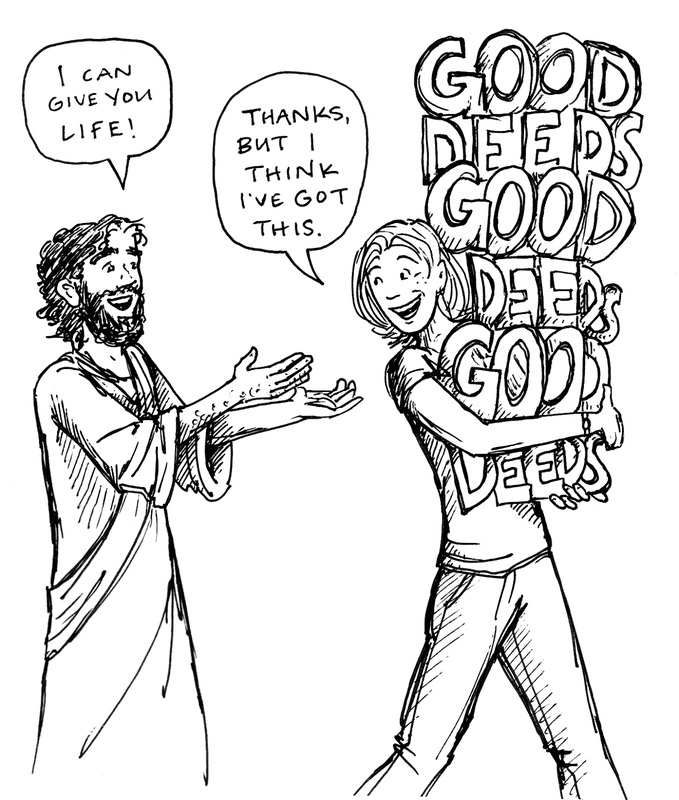 A faith with good deeds is genuine, a faith without good deeds is dead (v.17). In other words, if one truly has faith it will show in their good deeds. Your good deeds do not earn your salvation, your faith does, the good deeds are just the consequence of the faith. If you’re having a hard time wrapping your head around that here is an analogy. A thermostat controls the temperature in a room and a thermometer reflects the temperature in the room. The thermostat can make the room get cooler or hotter, but the thermometer cannot make the room get cooler and hotter. However, the thermometer is a gauge by which you know the thermostat is working. If you set the thermostat to seventy degrees and the thermometer never gets below eighty degrees, then you know the thermostat is not working. Likewise, good works is a way to gauge genuine faith, but it is not how we receive salvation. Good works can’t get you into heaven just as a thermometer can’t make a room cooler or hotter. In Romans, Paul harmonizes on the issue by referring to obeying the law versus faith. “Now we know that whatever the law says, it says to those who are under the law, so that every mouth may be silenced and the whole world held accountable to God. Therefore no one will be declared righteous in God’s sight by the works of the law; rather, through the law we become conscious of our sin. But now apart from the law the righteousness of God has been made known, to which the Law and the Prophets testify. This righteousness is given through faith in Jesus Christ to all who believe. There is no difference between Jew and Gentile, for all have sinned and fall short of the glory of God, and all are justified freely by his grace through the redemption that came by Christ Jesus,” Romans 3:19-24 (NIV). The thought I’m finally left with is this: When once accepts Christ and tries to truly live for Christ and obey God’s commandments, good deeds and works naturally ensue. If someone claims to be a Christian but they’re consistently hurting, slandering, and attacking others, then clearly they do not have faith in Christ, for if so they wouldn’t do these things. One could also say non-action is also a sign of a dead faith, because a faithful follower of Christ would commit to action when it came to helping and serving others. As Henry seems to suggest, it is the only way to really prove your faith in Christ. So with better understanding it is apparent that there is no contradiction at all. Salvation comes through faith in Christ. Faith in Christ manifests good works in our lives. Thus you will see good works in the lives of the faithful, but it is our faith in Christ that achieves our salvation.